As you all know, I am a big fan of free content on the internet! It is like looking at a few pages in a bookshop: people can get a taste of the writer (um, I mean, see some of their words, not… lick the writer. Don’t do that.) and see if they like. I am also a big fan of Jennifer Lynn Barnes. You can see my thoughts about her book Raised By Wolves here. I do enjoy Jen Lynn’s books, and her company! She is an extremely smart lady who writes twice as fast as I do, and has many times through example educated me about feminism, tolerance and also monkeys. Also, the first time I ever met her we had ice-cream, and that prejudices me in people’s favour. So Raised by Wolves, if you haven’t read it or didn’t click the link (bad moves both) is about a human girl raised by werewolves (MONSTERS IN THE FAMILY, oh my heart) who is trained by her pack leader to be a badass because isn’t that what you do when your little girl might want to start dating? Also contains: blonde best friends with shotguns, showdowns with evil, and thought-out pack dynamics. Trial by Fire is the sequel. It comes out the same day as The Demon’s Surrender, and both of the covers have fire on them. See? SARAH: We should do something to celebrate this. JEN LYNN: Yes. Something with fire. ALLY CARTER, WISE FRIEND: I strongly urge you not to do whatever you are thinking of doing. SARAH: Maybe we should video ourselves running with matches! JEN LYNN: Lit matches, of course! ALLY CARTER: DO NOT DO THIS THING. SARAH: I mean, though it’s traditional to run with scissors. ALLY CARTER: I hate everything about where this conversation is going. JEN LYNN: Like a werewolf! SARAH: I would call it a scistorch. JEN LYNN: Will you send me one? ALLY CARTER: … I shan’t sleep tonight. I will be FRETTING. Warning: A scistorch should not be used by casual blog readers in their homes. Jen Lynn and I are highly trained experts. Anyway, I am always puzzled about how to do sequel reviews without massive book one spoilers and without repeating myself, so I have decided to just give you a look at a side plot of, and some side characters in, Trial By Fire. Illustrated with pictures from The Vampire Diaries, because it also has a werewolf and a girl called Caroline who I strongly feel should be together. This is Caroline. She is just your everyday cute blonde ice-hearted assassin. Really: She kills people. She is really good at it. This is Devon. He is a ferocious fan of the theatre. And hair product. He is a big hit with the ladies. Also: he is a werewolf. Caroline’s sorry if Devon’s impending demise is about to ruin his day. Except… not really. Clearly, they should be together, and clearly, Trial By Fire is awesome. And now without further ado (Please yes, Sarah, there has been so much ado!) I give you chapter two of Trial By Fire beneath the cut. Chapter One of Trial By Fire can be found here at Ally Carter’s blog. Sated and soothed, the pack slept. My all-too-human body was worn past all endurance, but for the first time in days, my pack-sense was calm, and the others’ minds were quiet in my own. Their presences ebbed and flowed at the edge of my consciousness, and as I finally collapsed onto my bed, the protests of my aching body dissolved into infinity, into nothing. I dreamed of wet grass and fallen leaves that crunched under my bare feet as I walked. I couldn’t see my body, couldn’t make out the outline of a single rock or tree, but I shrugged off the blindness as a mild inconvenience. My body knew what it was doing better than I did, and the scents I took in with each step were rich and familiar: damp soil and dew, cedar and cinnamon. A sound. To my left. My nose twitched and I whirled, my hair fanning out around me, my knees bent, ready to pounce. Ready, if necessary, to run. For a moment, there was silence. A twig snapped. Leaves rustled, and then I made out the faint sound of paws on wet ground. I knew that much with certainty, but who the wolf was and why it had come here, I had no idea. The list of people who wanted to see me dead wasn’t short enough that I could ignore the possibility of a threat. Still, no matter how hard I tried, I couldn’t coerce my feet into moving, couldn’t keep my body from crouching down or my arm from moving to hold out a beckoning hand, palm up. The wolf moved closer, until I could feel the heat of its body, the warmth of its breath against my palm. I wanted to see, willed myself to see, and then there was light. The wolf in question was female, larger than some but, based on the size of her paws, not quite full grown. She was thin—and, I knew instinctively, fast—built along lean, muscular lines that were almost masked by thick honey-brown fur that gave way to darker markings around her face and a bit of white near each of her paws. She brought her eyes to mine, and there was something regal about the motion. I held my breath. I waited. She showed her teeth. She ducked her head. Finally, slowly, she stepped forward, that much closer to my outstretched hand. And then the world froze and we were caught like that, inches apart, neither one of us able to close the gap. I fought the paralysis, but it didn’t break until the scene around me had shifted and I found myself back in the clearing, the ground covered in snow, my body wrapped up in layers and layers of clothing and the wind whipping my hair at my face. It took me a moment to remember that after our run, I’d gone back to the cabin and fallen asleep in my own bed. I’m still asleep, I thought. I’m at home in my bed, asleep. This is just a dream. Despite the realization, I looked for the rest of my pack. I searched for them, with my eyes and with the part of me that knew each and every one of them like they were extensions of my own body. I looked for the strange wolf who’d almost brought her nose to touch my hand. But all I saw was a human, a stranger. A man. The part of my brain that thought like a girl recognized the cockiness in his expression and put his age at five or six years older than me. The part of me that thought like Pack felt his presence like white noise, high-pitched and deafening. My instincts returned full throttle, and I braced myself for a fight, but the man never blinked, his light eyes focused on mine, his head tilted slightly to one side. Slowly, he raised his right hand, the same way I’d beckoned forward the wolf. I felt the fight drain out of me, like a tire going flat. Mesmerized, I walked toward the stranger with the diamond-hard eyes, and a serpentine smile spread over his face. Flames leapt to life at the ends of his fingertips, and I froze. Eyes glittering, he lifted one flaming hand and waved. Just a dream, I told myself. It’s just a dream. With the smell of smoke thick in my nostrils, I woke up. By profession, Keely was a bartender. By nature, she was supernaturally good at getting secrets out of people, and in the past six months, she’d become the third in the trio of adults in all of our lives, the cool aunt to Mitch’s and Ali’s more parental presences. Long story short: no matter how much I didn’t want to talk about the way I’d woken up that morning, covered in sweat and ready to swear that the house was on fire, I didn’t stand a chance of keeping my mouth shut. Because werewolves had a habit of sniffing out lies—literally—I’d spent years training myself to tiptoe around the truth. Rather than fight the compulsion to tell Keely everything she wanted to know, I made an effort at telling her the most abbreviated version of the truth I could manage. I thought on the question for a couple of seconds before the bartender’s uncanny ability for getting answers—which we called a knack—had my lips moving completely of their own volition. “One second, I was dreaming, and the next, it was like I was being watched.” I shuddered, remembering the way the cocky stranger had observed me, like I was some kind of specimen under a microscope. “Do you think it was anything?” Keely’s question was deceptively simple, and she masked its significance by turning her back on me and going to get refills for the handful of other patrons who’d found themselves at the Wayfarer on Thanksgiving Day. Grateful for the temporary respite, I considered her question: did I think there was something to this dream? Whether the answer was mine as a human or the result of the pack-sense that had long since woven itself into the pattern of my thoughts, I couldn’t say. In either case, I wasn’t keen to share it with Keely, who would relay my answer to Mitch, who told everything to Ali, no questions asked. Sometimes Keely’s knack really sucked. Once I was safely out of range, I paused to give Keely a disgruntled look and caught sight of Lake plunking her elbows down on a nearby pool table. I could tell by Lake’s posture that she was preparing to lecture a couple of our twelve-year-old pack-mates on the art of the hustle. I found myself nodding in agreement with Lake’s lesson, because those were words to live by—in pool and in life. The way Keely looked and the fact that she was human kept most Weres from realizing that she had a way of making people admit things they had no desire to say out loud, and it wasn’t like I looked like much of a threat. Our entire pack was a testament to the power of being underestimated. We were younger and smaller and newer to the werewolf game than any of the other packs, but like Keely—like me—my charges were more than they appeared to be. Most werewolves had at least one werewolf parent, but my pack—aside from Devon and Lake and a few others—was different. I was human, and the others had been at one point, too. The only difference was that they’d been bitten, and I hadn’t. Most humans didn’t have what it took to survive a major werewolf attack, but those of us who did had one thing in common—a knack for survival. I’d spent most of my life as the underdog (no pun intended), so supernaturally good survival instincts had come in handy more than once—and I was fairly certain they would again. Or at least, I hoped they would. Images from my dream—eyes watching me, flaming fingertips, waving hello—flashed like lightning through my brain, leaving an impression in their wake that I couldn’t quite shake, but I did my best to keep them from bleeding out to the rest of the pack. Leaving Lake to her lecturing, I pushed the front door open and was greeted by a chilly breeze and a feeling of wrongness that I recognized all too well: the sound of fingernails on a chalkboard, the smell of black pepper and rotting leaves. My back arched, and the only thing that saved me from growling was that I wasn’t actually a Were. My pack-sense went into overdrive, as it always did when a strange werewolf stepped foot onto Cedar Ridge land. Territory was everything to people like us, and though we allowed peripheral males from other packs to cross through our slice of Montana on a semi-regular basis, my reaction to their presence was always, for the first few seconds at least, completely visceral. Instinctively, my eyes scanned the grass lot, looking for the intruder in question, and the moment they landed on a familiar form, my pack-sense relaxed, and my stomach tightened with nausea and guilt. “Casey.” I greeted him with a nod, giving no visible indication of weakness. I’d been taught to hide my emotions by the master, and even though my temper had a tendency to get away from me, I could have written the book on pretending to be okay when a major part of you wasn’t. “Bryn.” Casey returned my nod but didn’t quite meet my gaze. Within my own pack, everything seemed so natural, but interacting with people from other packs—older male people in particular—was a jarring reminder of my alpha status. I was sixteen, female, and human and had at one point been this man’s subordinate. The only thing that made his deference now more awkward was the fact that a lifetime ago, he’d been married to Ali. If it hadn’t been for me, he still would be. Babies were prized in any pack, and Katie and Alex had no end of teen and preteen admirers anxious to pull babysitting duty whenever Ali needed a break. Before Ali had left Casey, the twins had been the darlings of Callum’s pack. Now even their father was relegated to the occasional holiday visit, which reminded me . . .
“Ali didn’t say you were coming.” I met Casey’s eyes, and he glanced away. Werewolf law dictated that Casey’s ability to visit Cedar Ridge lands depended on my consent, but given that I was a large part of the reason he’d lost Ali—and the twins—I wasn’t about to bring Pack politics into this. Casey’s jaw clenched when I said Mitch’s name, and I kicked myself for inadvertently baiting him. Werewolves tended to be possessive of their females, and one very human divorce hadn’t managed to convince Casey’s inner wolf that Ali wasn’t his anymore. Luckily, however, I had no illusions whatsoever about Ali being incapable of taking care of herself. She had even less tolerance for dominance maneuvers than I did, and if there was something going on between her and Mitch, I doubted she’d think it was Casey’s business any more than she thought it was mine. My words caught Casey off guard, and for a moment, he looked like he might actually smile. Instead, he held out a small package wrapped in brown paper. I took the package and pushed down the urge to tear immediately through the paper, the way I’d opened Callum’s gifts when I was little. Things were different now, and this was a token from one alpha to another. The situation called for a little dignity. The second Casey stepped inside the Wayfarer and the door shut behind him, I ripped through the paper, shredding it to reveal a small green box underneath. Since I seriously doubted Callum had sent me a box, I dropped the paper and began gently tugging the lid off the top of the package to reveal . . .
stolen off bulletin boards around town. Callum carved wood, and apparently, he’d carved this piece for me. I turned the box upside down, and the horse, no bigger across than the width of my hand, fell out into my palm. There was no note, no explanation—just a little wooden horse that, for whatever reason, Callum had sent to me. A year earlier, I might have rolled my eyes at the gesture and been secretly pleased that he’d thought to give me anything at all. Now I was suspicious. Highly suspicious. What are you playing at, Callum? There was a part of me that expected a response to my silent question, even though my pack-sense no longer extended to Callum or any of the other members of the Stone River Pack. They were Stone River, I was Cedar Ridge, and we might as well all have been human when it came to feeling each other’s thoughts. Seriously, Callum. A miniature horse? I knew this wasn’t just a gift, the same way I knew that Casey was here as much for Ali as for the twins. Werewolves were creatures of habit, and if there was one thing I’d learned about Callum in a lifetime of growing up in his pack, it was that he never did anything without purpose. Easy there, Bryn-girl. Everything I’ve done, I’ve done for you. It was easy to imagine Callum saying those words, just like it was easy to imagine him whittling, the knife moving in a blur of motion, wood dust gathering on the backs of his fingers as they moved. The horse was not very forthcoming with answers, so I tucked it into the front pocket of my jeans, annoyingly sure that someday this little gift of Callum’s would make perfect, crystalline sense and that I’d probably kick myself for not seeing the why sooner. Until then, I’d just have to be patient. In search of a distraction, I went to look for Chase and found him sitting at the edge of the woods, almost out of sight from the restaurant and small cabins that dotted the rest of the Mitchells’ land. I was only half joking. Lake had a fondness for weaponry and a habit of treating firearms like they were pets. If you weren’t used to it, it could be downright disturbing. Of all the words I’d heard used to describe Devon Macalister, fine wasn’t a particularly common one. People either loved Dev or hated him; there wasn’t much in between. It took me a moment to realize that Chase wasn’t talking about the kind of quiet you heard with your ears. The rest of the pack couldn’t sense one another as strongly as I could sense them, being alpha—but I remembered what it was like to have the whisper of a pack constantly pulling at the edges of your mind. For Chase, who spent so much of his time at the edges of our territory, the noise level here was probably deafening. “Quiet, huh?” I said, trying to remember what that was like. Chase reached up to take my hand and nodded, rubbing his thumb back and forth over the surface of my palm. Without meaning to, I saw a flash of his thoughts, saw that he could have shielded his mind against the others but had chosen not to, because that would have meant closing me out, too. I settled down on the ground next to him, matching his silence with my own. With Devon and Lake and even Maddy, I was always talking, joking, arguing, laughing, but with Chase, I didn’t have to say anything, didn’t even have to think it. Given everything I had to think about—Callum’s cryptic gift, Casey’s arrival, the feeling that my dream the night before hadn’t been just a dream—there was something calming about sitting there, just the two of us. For someone with the size and build of an NFL linebacker, Devon was impressively light-footed, and he appeared above us without any forewarning, oblivious to—or possibly ignoring—the implication that if he’d arrived a few minutes later, he might have interrupted something else. I was on the verge of answering, but Chase beat me to it. “I could eat,” he said simply. I rolled my eyes. Chase was a werewolf, and he was a boy. He could always eat. A flash of something passed between us, and I knew that Thanksgiving really was something Chase had heard about but never experienced—at least not in a way he cared to remember. I added that to the list of things I knew about the boy independent of the wolf. From what I’d already gathered about Chase’s human life, being attacked by a rabid werewolf and waking up in a cage in Callum’s basement was pretty much the best thing ever to happen to him. My own childhood hadn’t exactly been sunshine and rainbows, but I didn’t push the issue—not with Devon standing right there, looking at the two of us and processing just how close my body was to Chase’s. The two of them were remarkably chill for werewolves. They didn’t play mind games with each other, and they never made me feel like property—but there was still only one of me and two of them, one of whom had been my best friend forever, and the other of whom made my heart beat faster, just by touching my hand. Devon stiffened. Chase’s pupils pulsed. 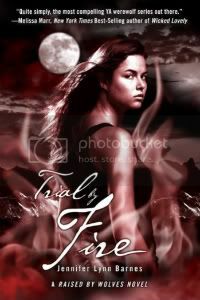 Chapter Three of Trial By Fire will be up on Carrie Ryan’s blog tomorrow! Jen Lynn is giving away tons of books here! And that’s a wrap. Hope you enjoyed. Remember: don’t play with scistorches.